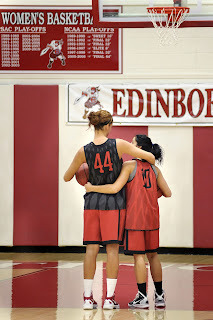 Edinboro University of Pennsylvania women's basketball players Samantha Blazetic, left, and Kerry Connolly were photographed prior to practice at the McComb Fieldhouse at Edinboro University on March 6, 2012. I like this photo because it says something about the camaraderie of the team. They're more than just players, they're friends. Nice little moment that you don't always catch.